BlueBeat.com, based in the US, streamed and sold music by The Beatles, Coldplay and others until it was sued in 2009. 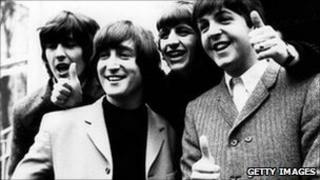 In the few days before it was forced to shut down, it had distributed more than 67,000 Beatles tracks. Judge Josephine Tucker ruled that the site had violated the music labels' copyright and was unfair competition. BlueBeat had denied wrongdoing, claiming that owner Hank Risan's pioneering technique of so-called "psycho-acoustic simulation" allowed him to produce unique versions of copyrighted music. The judge rejected that argument on the grounds that Mr Risan's versions were based on tracks he had purchased on CD. She labelled the justification as "obscure and undefined pseudo-scientific language [that] appears to be a long-winded way of describing 'sampling'." BlueBeat's attorney, Archie Robinson, said the settlement was a fraction of what music companies EMI Group PLC, Capitol Records and Virgin Records America had sought. "I felt that was sort of an acknowledgement on their part that they don't have the damages they claimed," he said. He said the California-based BlueBeat site was still active. "So long as we pay royalties, we can stream their music all day and all night without a problem," he said. Music by The Beatles has been available on iTunes since November 2010, but for years music label Apple Corps was involved in a bitter trademark dispute with Apple the computer company. The dispute was finally settled in 2007.